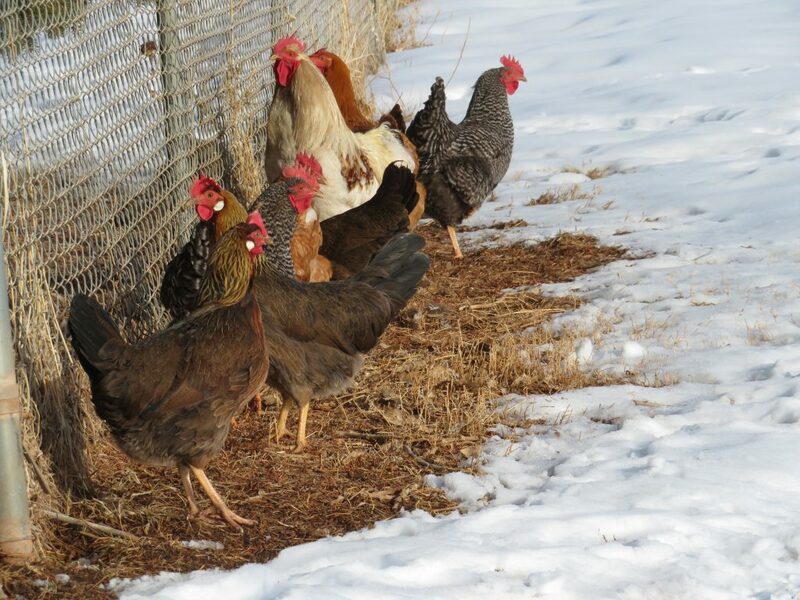 My chickens are happy with the tiniest bit of bare ground that they can find. I see it as kind of a “lemon/lemonade” scenario. The eleven hens are giving me 8-10 eggs a day… so if it makes them happy to scratch around in the wee spot of earth they find outside my yard fence or even if they get “lost” over by the corral (and I have to go on a chicken hunt so they lay eggs *IN* the coop)… I should be happy. Can we all just BE happy??? As I have said so many times before, I really do enjoy your pictures AND wouldn’t this pic of the hens make a great puzzle? Lovely picture! You’re getting a lot of eggs for this time of year. Do you use a light in the coop? Little sweeties! I miss my hens so much! I even would scoop paths for them to get to a dry spot where they liked to dust themselves. That’s love! Pretty good to get that many eggs from 11 hens in this kind of weather. Very nice look’n flock of chickens! can’t beat fresh eggs! !